I’m so excited to be part of the big Summer Staycation posting today that bloggers all over the blogosphere are taking part in hosted by The Happy Housewife and Springs Bargains! The idea behind this is that with rising gas prices, as well as so many other things that we budget for (like food) going up, more and more families may need to have a Staycation this year instead of a Vacation. It’s when you stay in your own town (or perhaps go somewhere close) to have your family vacation, instead of traveling far away. It would be very possible to do this and still spend lots of money, of course. But, the goal of the bloggers writing is to share some free and inexpensive things to do in whatever area they are writing about. The Henry Vilas Zoo covers an area of 30 acres and is home to all of the kinds of animals you might normally find at a larger zoo (and some you might not, like a red panda and a badger). The zoo is open from 9:30 am – 5:00 pm daily. Note: If you are driving to the area, you will likely have to pay for parking. The maximum price for this is typically $3. Indeed, Madison is surrounded by two large lakes. The Madison Parks department has 13 beaches, of which 10 have life guard services during the summer months. Sand castles, swimming, and a picnic lunch, anyone? 4. Ella’s Deli – This kitschy, sensory overload deli is a fun stop for an ice cream and maybe even a carousel ride. The ice cream, I will warn you, is a little on the pricey side. They make their chocolate and vanilla in-house, while all other flavors are from The Chocolate Shoppe, which is local to Madison as well. (The Chocolate Shoppe makes some of our favorite ice creams!) I would skip out on actually getting a meal, as it is very expensive for what you get, and I’ve never been crazy about anything I ate there. But, it is definitely worth popping in and taking in all of the decorations in this kid paradise. 5. 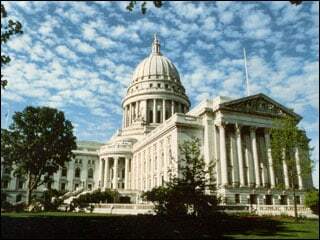 Tour the Wisconsin State Capitol Building – An excellent lesson in history, government, and architecture, you can schedule a tour to visit the Capitol Building in Madison. Reservations can be made for a tour, but if there are less than 10 people in the group, then reservations aren’t required. 6. Governor Nelson State Park – Located on the north shore of Lake Mendota, “Governor Nelson is a 422-acre day use park. It has a 500-foot sand beach, bathhouses with solar-heated showers, a four-stall boat launch, a fish cleaning facility, picnic areas, barrier free playground equipment, prairie restorations, 8.4 miles of hiking/cross country ski trails, and a scenic overlook of Lake Mendota.” (source: Governor Nelson State Park website) This would make an excellent full day outing, with picnic areas and grilling areas available. 7. Dream Park – Clued into this attraction by my friend Becca, there is a park like this in both Monona and Sun Prairie (both close suburbs of Madison). 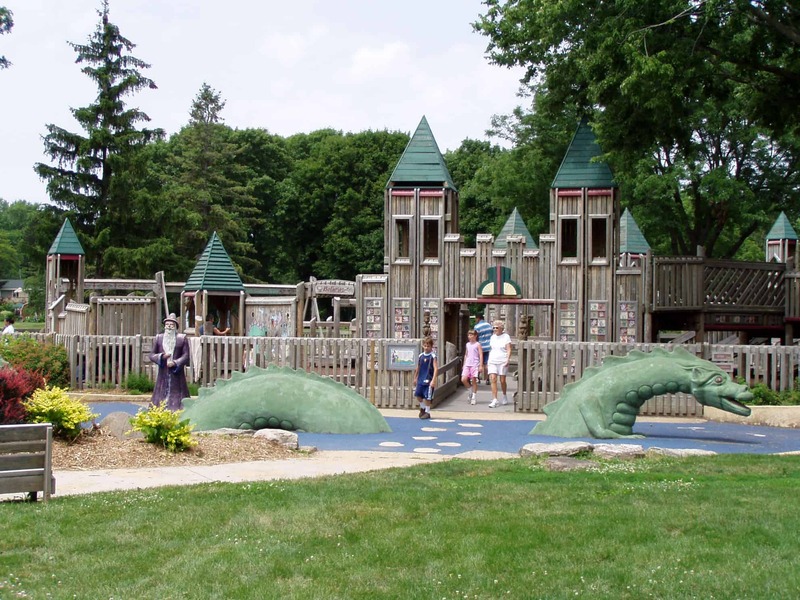 Monona Parks website tells about Monona Youth Dream Park, “The central area of the Dream Park resembles a large castle with turrets, walls and bridges, a painted moat at the entrance and a dragon sculpture rising from it. A wizard statue welcomes you into this magical land.” This park, or the similar one in Sun Prairie, would make a wonderful destination for a day at the park with a picnic lunch! Poynette is also a quaint place to visit, boasting a few gas stations, a Piggly Wiggly grocery store, Willy’s Weenie Wagon, and my Grandparents’ house, amongst other things. 10. I’m going to use number ten to link you up to ten more things to explore on your own online that are free or inexpensive in the Madison area: Art Fair on the Square, Wisconsin State Historical Society Museum, Madison Museum of Contemporary Art, University of Wisconsin-Madison Arboretum, Chazen Museum of Art, University of Wisconsin-Madison campus, Olbrich Botanical Gardens, Geology Museum, Wisconsin Veterans Museum, and browsing (and shopping) on State Street (my favorite of this is Maxwell Street Days, which is actually on State Street annually in July). I have to give one last shout out that is not free or inexpensive. Just in case you are traveling to Madison or you live in the area and just want a family-friendly night away, my family loved our stay at the Comfort Suites in DeForest (another suburb of Madison). With a friendly staff, nice rooms, and a wonderful pool area, we just loved it. The pools are all saltwater, and include a very shallow kids area with fountains (which were a hoot), a regular pool with basketball hoops, and a large hot tub. Loved it! Thanks so much for joining me on my overview of a Staycation (or an actual vacation, if you’re not in the area but want to visit) in Madison, Wisconsin! Tomorrow, I’ll be posting a list of links to all of the participating blogs, featuring sites in almost state. I’ve never visited the Midwest before but if I ever visit the Madison area I will be sure to print out this post for reference. I’ve enjoyed getting a glimpse of your favorite things to do. We usually drive by Madison several times a year on our way from Chicago to Minneapolis; we’ve occasionally stopped to visit Ella’s Deli and have talked about taking a family weekend there. You’ve motivated me to plan one — there’s alot to do in Madison that I didn’t realize! 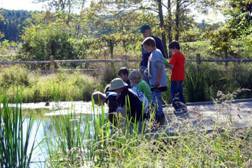 And I didn’t realize realize there was a nature center in Poynette. Wow, can’t wait to check out all the places you listed. If you are ever driving a bit farther east on the interstate, there’s one of those dream parks in Janesville, too. Take the same exit as the visitor center (you will see signs for the visitor center on the interstate). It’s in a really nice park across the street from the visitor center. Besides the castle-themed play equipment, it also has a wading pool for kids, ‘lots of grassy park area to run and play, and picnicking areas. When my kids were a bit younger, it was their favorite place to stop on our drives to Minnesota. I used to live smack between Milwaukee and Madison – and went to Madison for state competitions for both music and forensics. And a stop at Ella’s Deli was basically essential for us every time! :^) I live in Green Bay now, but need to remember to stop in there – and at many of your other suggestions – if/when we decide to explore Madison as a family. LOVE your list sister! We have visited each of those places mentioned. Ella’s Deli is a favorite of ours… give me that big salad any day of the week! Many times I took the boy down to the beach (James Madison Park) to feed the ducks that congregate each year around the same time… he loved it, and we often met fun playmates in the process. State Street and Maxwell Street days are THE BEST. Even without spending a dime, you can see bits & pieces of the individuals who make up an eclectic city. The people watching in Madison is awesome! One of my favorite facts to tell kids is that Madison is built on an Isthmus. An Isthmus is an area of land between two bodies of water. Many fun facts and lots of great things to do in Madison… cannot wait to go back home again soon! Great list! I used to live in Madison for a few years, but before I had kids. I still live in WI though and I hope we can get back down there to visit! As a Madison local, I can easily say more to the effect of staying at the Madison Hostel international for a more frugal family adventure to Madison. Complete with a kitchen, and bunk beds for the kiddos, this hostel experience is a frugal choice to be able to cook for your family while away (even just cooking breakfast or a midnight snack helps), and is close to everything! It’s about 15 dollars a night per person. Thank you! I live between Madison and Milwaukee and have 4 children. I am always looking for things to do. We visit Sun Prairie often because they have so many great parks and all this time I did not know they had a dream park. I can’t wait to go there. LOVED reading your blog post – will be back to read your blog. Glad I found you. We moved this past year from Madison to Milwaukee, and all your suggestions are right on! There is one additional Dream Park on both the west side and east side of town – west side Madison and in Deerfield. Both are gems (we love the Monona and Sun Prairie, as well)! We used to live around the Deerfield, WI one and it’s barely ever busy. Bonus with little kids! I have a question about the Madison area beaches. Are they free or is there a charge to use them? Anyone know? I don’t think anyone mentioned the Splash Pad in Middleton yet. Free and perfect for families, especially when it’s blazing hot. I believe they are planning one for Fitchburg, too. Splash pad at Lakeview park in Middleton is awesome. Devil’s Lake and Governor Nelson park are also great for hikers or beach goers. Olbrich Botanical Gardens is also free. UW Madison Union terrace is a great spot in the summer, Right on the lake, ducks are always around, usually live music playing, food/drink available. Thank you! Will use your list to jump start our exploration of our new home. Moving to Madison, in July, with my three kidlets. And I too am flying by the kite strings of God’s amazing grace!